Log rolling isn’t just for lumberjacks and lumberjills anymore. 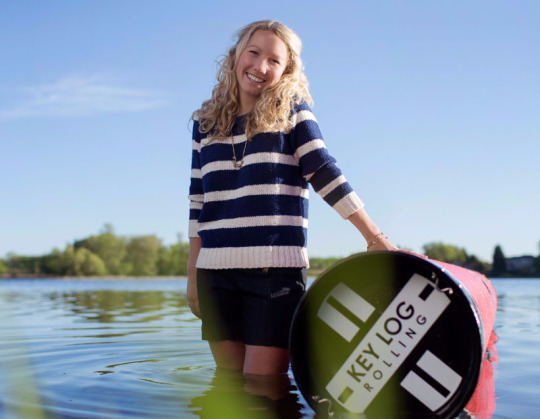 Abby Hoeschler of Key Log Rolling talks about all she’s learned from the sport of log rolling and how it applies to starting and running a business. Abby Hoeschler, founder of Key Log Rolling, is the daughter, niece, and sister of several world log rolling champions, so she comes by her passion for this unique sport honestly. She has been a log rolling competitor, coach, and promoter for more than twenty years. At age thirteen, Abby started a neighborhood log rolling school in her hometown of La Crosse, Wisconsin and has been teaching ever since. After graduating from Middlebury College with a degree in art history (where she led the log rolling club), she was inspired to fulfill her family’s vision of making the historic sport more accessible to a wider audience by creating a lightweight, synthetic log rolling log. She was a top log rolling competitor but, more importantly, she had shown her mother’s passion for teaching and starting programs. Combined with her father’s strength in managing a to-do list, she was ready-made for the job. (Art history would have to wait but someday she hopes to curate an exhibit on the use of log rolling imagery in pop culture). She set up shop in Minneapolis - the urban center of the land of 10,000 lakes - and began the task of finding engineers, manufacturers, and marketers to make the Key Log a reality. After one year on the market, the Key Log was awarded the “Top 5 Gear of the Year, 2013” by Outside Magazine. People of all ages and abilities across the country (and the world) are learning to Key Log Roll at camps, colleges, and community aquatics program. Abby has now introduced more people to log rolling in one year than the past one hundred years combined. In 2014, Abby was named the Minneapolis/St. Paul Business Journal’s top 40 Under 40. Her business has been featured on Yahoo Sports, the New York Times, and National Public Radio online. She continues to compete in log rolling, and consistently ranks within the top three of the sport’s elite women’s division and just so happens to hold the world record in the even more obscure event known as log boom running.